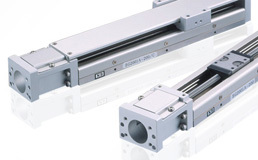 Actuator | Products Lineup | Products | NIPPON BEARING CO., LTD.
NB BG type is a compact single axis actuator which integrates a slide guide and precision ball screw. BG type offers compact dimensions and outperforms conventional POSITIONING TABLEs. This is made possible by a unique "U" shaped guide rail and slide block which provides multiple functions of a guide block and a ball screw nut combined into a single unit. The "U" shaped guide rail offers high rigidity against bending moment. This structural feature allows for integrated framework of machinery or equipment and can be cantilevered. Additionally, the slide block contains 4 ball circuits which delivers high load capacity, high accuracy and high rigidity. The integration of the slide guide and precision ball screw eliminates complex precision adjustment and reduces installation time dramatically. "U" shaped guide rail provides very high rigidity despite its compact configuration and can be used for cantilevered application. BG type contains four ball circuits and four-point contact ball grooves which contribute to its high rigidity. The combination of precision ground guide rail, slide block and precision ball screw provides high positioning accuracy. In comparison to conventional POSITIONING TABLEs, the BG type allows for compact designs and dramatic space saving. The "U" shaped guide rail and integrated slide block and precision ball screw make this possible.